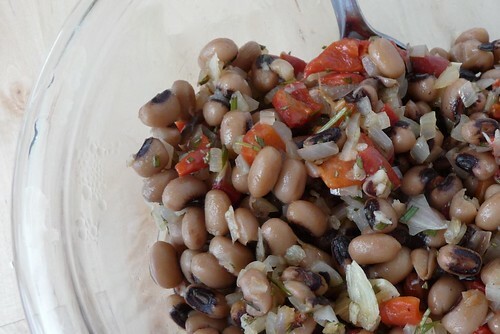 I made a simple, hot bean salad that was quite satisfying to go with our spanokopita meal. I wanted something easy that could be completely vegetarian (this can also qualify for vegan, I think) or expanded to suit a carnivore (mmmmm.. bacon and/or shredded blackened chicken). I think this one fits the bill. Though I’m not a fan of Rachael Ray by any means and I think that reading her recipes can be acutely painful (if I see EVOO one. more. time. I swear…), I find that I really like a lot of her food. Mom let me borrow a couple of her books so I could get an idea if they contain enough good food to warrant purchasing. I’m still on the fence about it but I’m wavering. 2 cans mild beans, such as cannelini, blackeye peas, etc. Over moderate heat, saute shallots and garlic in olive oil for 3 – 4 minutes. Add a pinch of salt, pepper, rosemary, red pepper and beans, continue to cook for about 2 – 3 minutes. Taste, adjust seasonings as necessary. Best served hot or at least warm. This entry was posted in dairy-free, gluten-free, salad, side, untranslated, vegetarian. Bookmark the permalink.